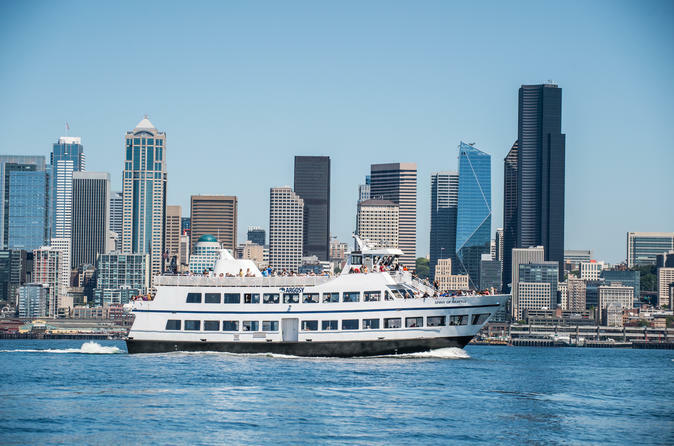 Enjoy a narrated cruise on Elliot Bay and Seattle Harbor, as well as spectacular views of the Seattle skyline and panoramic mountain ranges. The cruise that started it all! Since 1949, millions of guests have experienced the wonders of the Emerald City on the Harbor Cruise. During this 1-hour narrated cruise, you’ll learn Seattle history, be dazzled by the ever-evolving city skyline, explore the workings of our shipping port, get up-close views of Seattle’s historic waterfront, all wrapped up in the natural beauty of Elliott Bay and the surrounding Olympic and Cascade Mountain ranges. Whether you’re here for the views or the history, the Harbor Cruise is a delight for everyone. Just don’t forget your camera because the peek-a-boo views of Mt Rainier are stunning. See you on the water!